In some ways, he looks like a proud father showing off his kid. In other ways, he looks like a little boy who just finished playing with his Tinkertoys. Either way, OMRON’s Ed Allen had a lot fun yesterday showing our customers the NJ machine controller-driven demo that some people call the “Top Gun Demo” and others call a “Mini Factory Production Line.” Whatever you call it, Ed made it spin, swivel, identify, view, sort, pick up, drop and do all sorts of things to all sorts of other things. 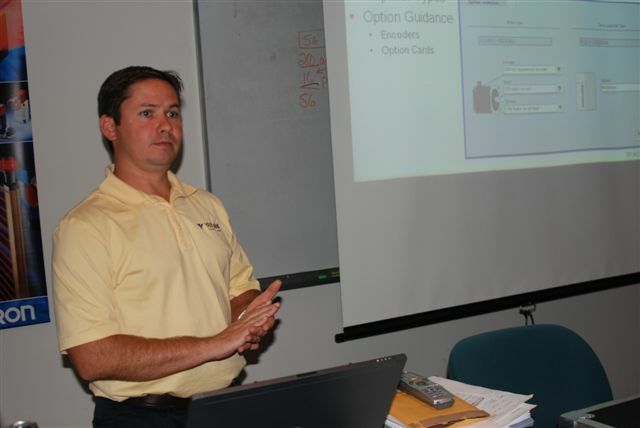 We had a full room of customers training on the OMRON PLC and after lunch, Ed showed off his programming handiwork. 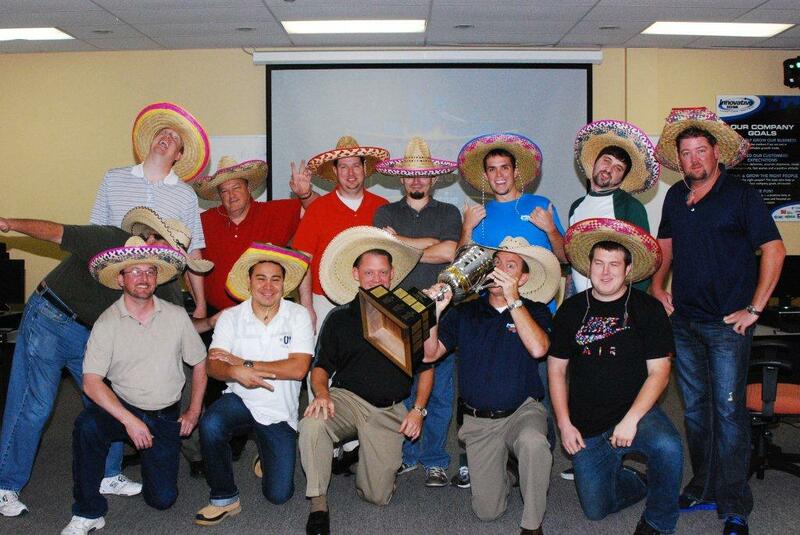 Our fourth company goal is to “Have Fun.” Witness the Class of May 2011, our most recent crop of hires who are attending “new man’s school” for the next couple of weeks here at I-IDM HQ in Dallas. Our 4th annual Cinco de Mayo party — one of the many customer appreciation events we unfold over the year — is this afternoon in Dallas. Next week, May 12, we will honor our Houston area customers with a similar shindig at our Hollister Road location. Special thanks to Omron, Parker, SMC and Yaskawa for helping to sponsor both events. Check out http://www.innovativeidm.com for details. 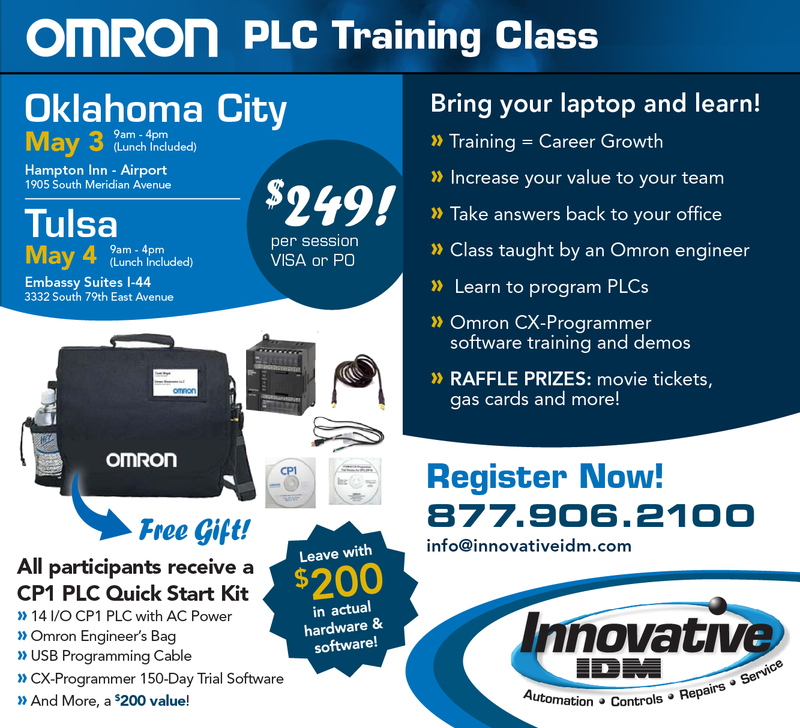 One of our most popular, the OMRON PLC training class, comes to OKC and Tulsa. Seating is limited at this point. This is one of our most popular classes of the year. Ed Allen of OMRON will teach this class. How easy is it to sign up for OKC or Tulsa PLC training? Call 877.906.2100 and sign up NOW. Come join the fun on Nov. 17. 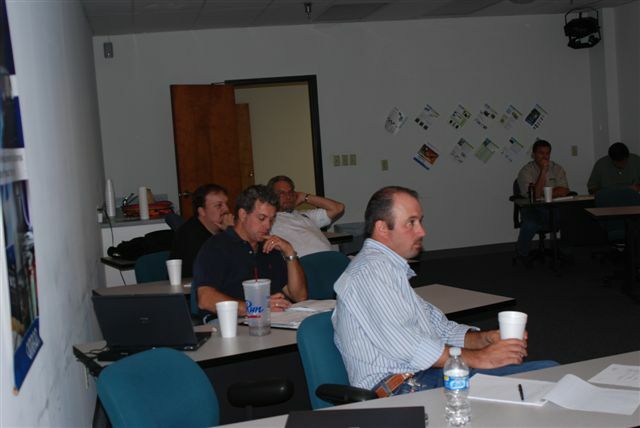 Innovative Automation will host Omron PLC specialists at its Carrollton location for a PLC seminar. You’ll leave with $200 in hard goods you can use at your plant. Call 877.906.2100 to register using a PO or a credit card. Jeff Moyer of Yaskawa Motion was here Friday to provide hands-on training to our sales and tech staff on Sigma V servo and other things Yaskawa. Our staff has regular training sessions with our core vendors to stay abreast of all of the current applications and features. All of this immediately following a meeting with a chicken.